The town of Bishop's Castle has a captivating mix of buildings from the medieval times onwards. The area teems with good walks and good pubs, two with their own breweries. For a small town it has a fair share of festivals, the Christmas Lights Festival and the Michaelmas Fair are two of the highlights. The cottage is on Union Street, running parallel to the High Street (post code SY9 5DF). 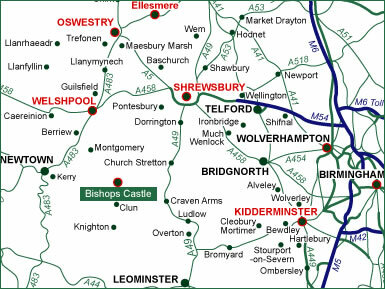 To us in Shropshire, Bishop`s Castle is a town, albeit a very small one! Tudor Cottage has the benefit of being near the shops, but with views of the hills. Market days are on a Friday, with a produce market held in the town hall, Farmer's markets are on the 3rd Saturday of every month. To the south lies Ludlow, Food capital of the Marches, with Michelin starred restaurants, gorgeous shops and architecture to match. The Ludlow Festival in June/July with Shakespeare performed in the castle grounds, and the Food and Drink Festival in September are not to be missed. For walkers there are fantastic opportunities throughout South Shropshire whether it is joining Offa's Dyke on the Welsh/English border, exploring the beauty of the National Trust's Cardingmill Valley or just ambling beside the river Clun.